What happened in those eight missing years to make a well-reviewed, commercially successful author fall so far so fast? Heartbreak? Rehab? Addiction to designer shoes? Easy: She took the wrong day job. An omission: Howard Norman’s “My Darling Detective” comes out March 28. Abigail Pogrebin’s MY JEWISH YEAR: 18 HOLIDAYS, ONE WONDERING JEW will be out March 14. The gorgeous, gripping debut novel Stay With Me by Ayobami Adebayo will be out on March 2nd. Thanks for the list The Millions staff. Much to look forward to and I am personally pleased Hannah Tinti has a new novel coming out. Congrats as well that 4 writers in your community are being published in 2017. Also, thank you thank you thank you. @Linda Abah, Stay with Me by Ayobami Adebayo is out in the UK on March 2nd but I don’t think it’s out in the US until August from Knopf. This list appears to cover the first half of 2017. It’s gripping as you said and quite brilliant. It’s already featured on a number UK lists for 2017. I expect it will make The Millions summer reads list. I was really hoping to see Emma Flint’s Little Deaths on this list, it’s out in a few days. It’s dark but phenomenal, there’s a well deserved buzz around it in the UK already, perhaps the US release date is much later too. Also Yuri Herrera has a new translation coming out in June 2017– Kingdom Cons– the final in the trilogy that won the best translated book award last year. Exciting! What about Knausgaard’s My Struggle Book Six? Don’t tell me I have to wait another year. ..
Another wonderful selection of books for starting off the first half of the new year. Thank you this is the most comprehensive list always I love you to pieces even if I don’t know the definition of bildungsroman. Someone enlighten me please! The Essex Serpent deserves a good look at it. Same here. Three-thousand pages of descriptions of turds and household chores weren’t enough for me. I simply can’t wait to read the sixth installment, in which I hear there’s a 200-page tract about Ove arranging his tool shed. I can’t wait, so I’ll simply learn Norwegian. 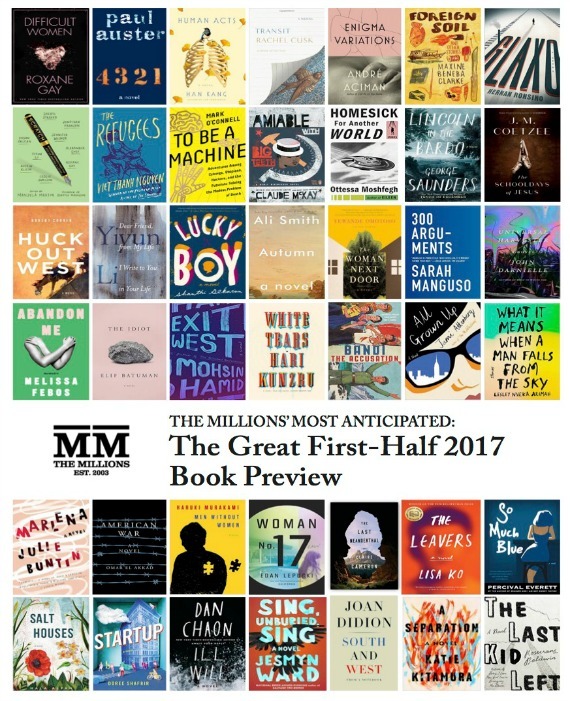 When will the second half of 2017 book preview be up? I’m really looking forward to it! I always view these lists with a mixture of hope and trepidation… there will be literary finds and there will also be low, banal, Publishing Product … but this list features Rachel Cusk’s Transit, and Cusk is a badass throwback to the days that literary T-Rexes ruled, and I am happy to see her here (the taint of the smell of the thing I hate most in current Lit… the workshopped/market-tested/by-committee sentence… is either totally absent from Cusk’s work or she somehow workshops her stuff with Updike, Sontag and Mailer). I’d love to see her in a literal cage match with all the “writers” I loathe. Also, interesting: is Paul Auster finally learning to really, really write instead of turning in passable approximations (now that his looks are finally degrading to those of a mere human)? Because the beginning of 4321 seems to have been written by a much more skilled “Paul Auster” (an alternative Auster, “ironically”). He’s still slinging clichés but, suddenly, he’s learned to twist the clichés into interesting shapes. Fingers crossed as I wade further into it. Recently it struck me that the list of books I’ve started and not finished has grown quite formidable. I ask myself what this “means,” if it reflects some kind of moral devolution.